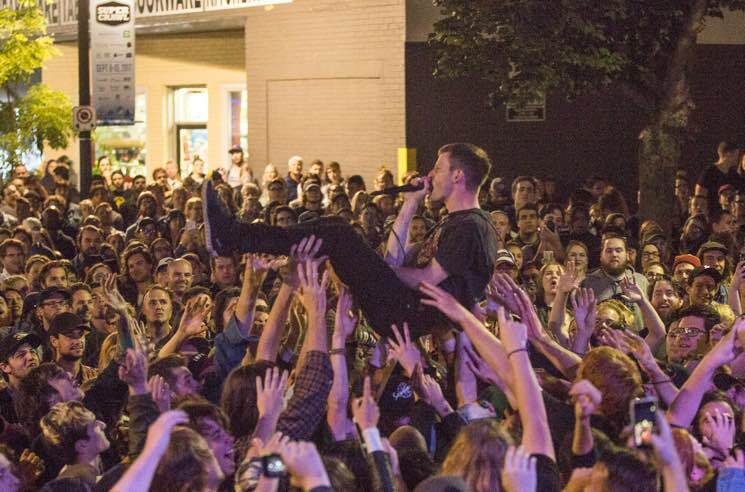 "The last time we played Hamilton, it was to 50 people at This Ain't Hollywood," PUP's Stefan Babcock told the Supercrawl crowd of hundreds as they closed out the festival's first night. The Toronto punks have achieved incredible success over the past few years and rightfully so — they've worked tirelessly to get where they are. After receiving a warm introduction from Ontario NDP leader Andrea Horwath, the quartet wasted no time launching into "Doubts" off their Polaris Prize-shortlisted record The Dream Is Over. Babcock sang with a noticeable grin stretched across his face as the crowd echoed each lyric, moshed and crowd surfed. When the latter became an issue with security, Babcock abruptly stopped mid-song to address the situation and waited for a resolution before resuming. That simple, genuine action reiterates why PUP's fans are so loyal and adoring — the feeling between fans and band is mutual. They ended the headlining set on a high note with the roaring one-two punch of "If This Tour Doesn't Kill You, I Will" into "DVP," delivering a cathartic performance that would have been a hard act to follow.